The HILL Doubletop PERFORMANCE Model is now being built and sold by NEW WORLD. The PERFORMANCE Model was designed by Kenny Hill and built by HILL GUITAR COMPANY for many years. This popular guitar is an economical doubletop guitar, giving the palyer all the benefits of this modern guitar technology, including sound ports and lattice bracing. Over the past several years Kenny Hill has been training our highly-skilled New World luthiers in the proprietary techniques and specifications making the PERFORMANCE Model a choice of professionals and serious players. The Standard PERFORMANCE Model is currently available with Spruce or Cedar double top with a choice of 650mm or 640mm string length through our New World and Hill Dealers and at the Hill Guitar Company in California. 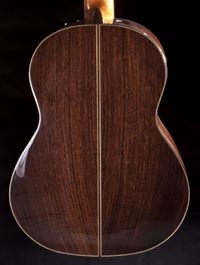 The intention of rebranding the PERFORMANCE Model is to make this imported guitar to be indistinguishable from the domestic HILL PERFORMANCE Model, but at a lower price point. We have succeeded in doing so, and invite you to try one. You may order directly from us at $4500 w case.